It begun as a soft patter, but soon the sound was unmistakable, it was rain. It may not have been the warm summer sun, green grass or an abundance of food, but it was hope. Hope that the planet was slowly adjusting to the apocalyptic world we now live in, as a result of the asteroid colliding with the moon almost twelve months ago. Miranda and her family have been surviving, which is far greater than most. The sky is still smoldering with volcanic ash, electricity is virtually non existent, having more than a small portion of a meal per day is a luxury, but with rain, at least that's more than they've had in months. The weather is slightly warmer, and with warmer weather, comes fishing, and fishing means surviving with one less worry where the next meal is coming from. But in addition to the feast both Matt and Jon caught, Matt surprises the family with another mouth to feed. When rations are stretched even further, what they didn't expect was to hear the doorbell, and for Miranda's father, his wife and newborn baby to be on their doorstep... And they haven't come alone. With a friend and orphans Alex and Julie, the Evans house is overcrowded, how can they possibly have enough supplies for ten survivors, including Miranda's new step sibling and nursing mother Lisa. Alex, affectionately referred to as the last boy on earth by Miranda, had made it his mission to keep sister Julie safe, even if it means sacrificing himself. After leaving the death and destruction of New York with three tickets to the illustrious 'safe town', Alex has no idea where the designated towns are located. Heading back in the opposite direction to leave Julie in the safety of the church convent, the two orphans begin traveling with Miranda's father in the same direction, headed home to his children. Everyone has a task, but for Alex and Miranda, ransacking homes of the dead and gone has never been so appealing. Miranda is thankful for the solace of being able to escape the overcrowded house, Alex wants to earn his keep, being too proud and stubborn to accept a helping hand. But when the two teens start to depend on one another, will Alex still leave her, tearing her life apart even further? Neither may get the chance, once a fierce and deadly tornado drops from the sky and rips apart what little life they are still holding onto. Death, debris and destruction will make survival a passing thought and they may not have anything worth surviving for. 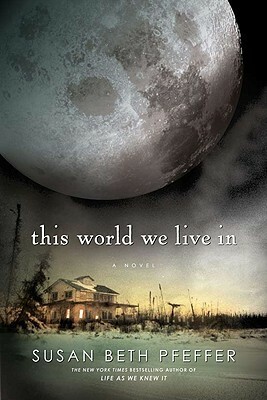 This World We Live In combines both families from books one and two in the series, Alex and Miranda's. The world is still in ruin, but as long as they're alive, hope is alive. I was disappointed at the inclusion of new character Syl, as the book wore on, I begun to despise her character and prayed for her demise. I love Miranda's character and her journal entries, she's far more engaging than Alex, who thankfully didn't share his point of view in The World We Live In. There is certainly instant love involved, in at least two cases, but it's virtually the end of the world and it seems more as though it's an act of compassion and companionship. Regardless, I just couldn't relate to Syl, or even Alex for that matter. Miranda is the hero of the series, she's emotional, honest and realistic. It does have an open ending to blend into The Shade of the Moon, the next and what I believe to be final book in the series, as told from Jon, Miranda's younger brother. Set two years into the not too distant future.